На правой руке располагается слово «целеустремленность» на арабском языке. This tattoo on her left underarm is the Roman number 13. She had it done because she doesn't believe in superstitions. 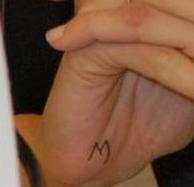 Later she had V MCMXL added to the tattoo. 13 May 1940 is the date when Winston Churchill gave a famous speech, in which he said: "I have nothing to offer but blood, toil, tears and sweat". "A prayer for the wild at heart, kept in cages." 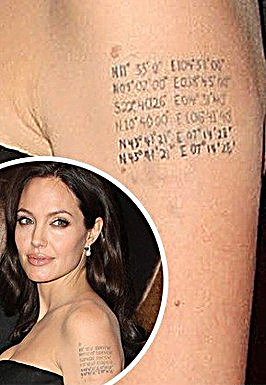 Angelina Jolie had this tattoo done in the presence of her mother. 1. Латинская цитата “Quod me netrit me destruit” поперек нижней части живота, которая переводится «Что меня питает, то меня и губит». This rune style tattoo on Angelina's wrist is the letter h. Depending on the source it is to remind her of her ex boyfriend Timothy Hutton or her brother, James Haven. 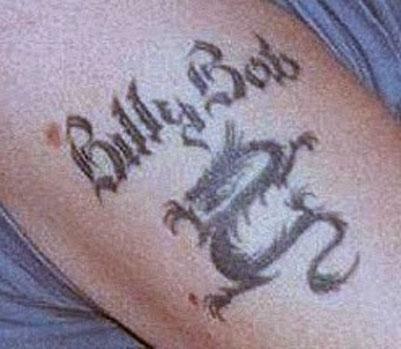 This is Angelina Jolie's Asian dragon tattoo with the name of her second husband Billy Bob Thornton above it (added later). She had it removed after they broke up. "I'll never be stupid enough to have a man's name tattooed on me again." It took 5 visits to the tattoo removal clinic to erase the dragon and you can still see it a bit. Jolie has 3 tattoos on her lower back: a tribal, a blue window and a tribal dragon. The tribal dragon is now partly covered by the tiger tattoo. The window is symbol for the fact that she always found herself looking through the window, wishing she was somewhere else. The window is covered up by the tail of the Bengal tiger. She had it covered because she is where she wants to be right now. This dragon tattoo with blue tongue on Angelina's hip is covered up by the cross tattoo (see above). She got it in Amsterdam while she was drunk. This abstract lines tattoo design on Angelina Jolie's right arm is a custom tattoo created by herself and Billy Bob Thornton. 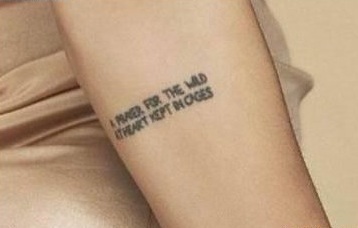 It is now covered up with the Arabic tattoo. This tattoo on Jolie's left shoulder blade is the Japanese symbol for Death and it reminds her to live. She had it removed and now has the Khmer tattoo for her son Maddox on that place. This Japanese tattoo was her first tattoo ever.